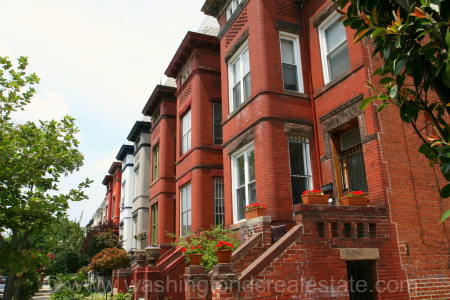 Bloomingdale is a quiet community of row houses, churches, and schools in the northwest quadrant of Washington, DC, that is close to the center of town and to the U.S. Capitol Building. Affectionately known as the community where “everyone knows your name,” Bloomingdale has seen extensive gentrification since the early 2000s. The housing stock largely comprises several blocks of tree-lined Victorian-style row houses. The majority were built in the early 1900s as single family residences while some have recently been converted to two-unit condominiums. Residents make liberal use of the front porches and stoops to socialize with other neighbors and exchange neighborhood news. A small commercial center near the intersection of Rhode Island and First Street is a popular gathering spot for residents with the Big Bear Café and Farmer’s Market in the summer as particularly beloved hang-outs. The Crispus Attucks Park is Bloomingdale’s own community managed green space and another favorite for children and dogs. Bloomingdale is not directly served by a Metro Station but has good bus access as well as Zipcar and Capital Bikeshare access. Bloomingdale is bounded to the north by Channing St., N.W., to the east by North Capitol St., to the south by Florida Ave., N.W., and to the west by Second St., NW.